Vlad shows Gustav Graves the modifications to another fancy bit of weaponry. This device attaches to the arm, and a fancy pants amulet it is too. The on-scene NSA agent quickly learns how shocking the device can be. It’s a bit of a multi-purpose device. He can turn his space brolly on with it as well. He obviously wasn’t entirely happy with the equipment though because by the time he’s on the next act of the film, he has had it incorporated into a suit. Poor old Vlad must have been up night and day in his workshop to finish it on time. 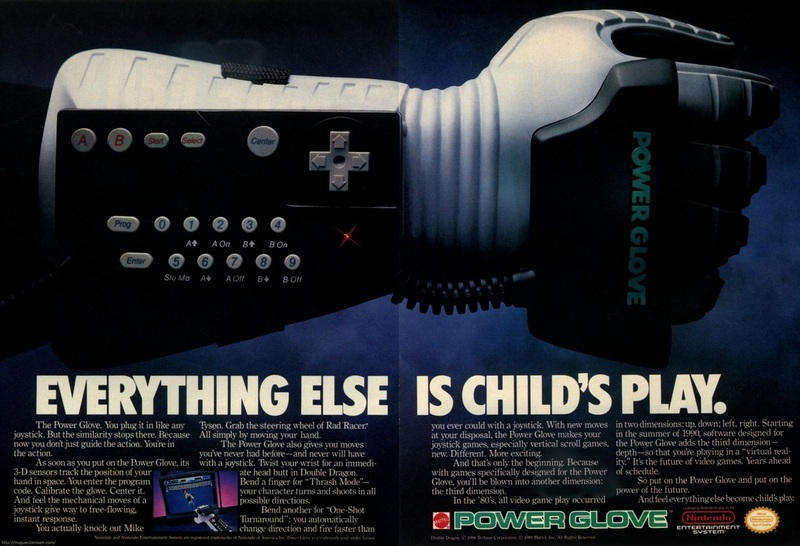 Released in 1989, the Nintendo Power Glove was possibly the inspiration behind the device, especially if you consider the writing time of the screenplay, filing schedules etc. Designed by Grant Goddard and Samuel Cooper Davis for Abrams Gentile Entertainment, and made by Mattel, the Power Glove was an advancement on the Virtual Reality technology of the period - which was also featured in the film. Based on the patented technology of the VPL Dataglove, the Power Glove was effectively an NES controller. However, only two games were released that the device could be used with: Super Glove Ball, which was a 3D puzzle maze, and Bad Street Brawler, which was a beat 'em up game. As the games were not released in Japan, this affected sales and the manufacturers declared bankruptcy. The future was also dim for alternatives of the Power Glove, as despite selling 100,000 Gloves, the games were received poorly, and the Power Glove was consigned to the good idea, but commercial failure, bin.